VERY FINE APPEARANCE. 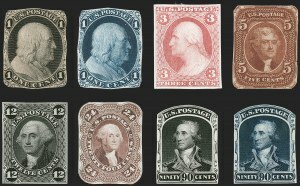 A BEAUTIFUL AND RARE SET OF THE 1861 TOPPAN, CARPENTER & COMPANY FULL DESIGN ESSAYS. VERY RARELY OFFERED AS A SET. VERY FINE APPEARANCE. 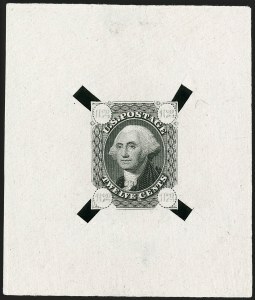 THE ONLY RECORDED EXAMPLE OF THIS TOPPAN, CARPENTER & CO. 12-CENT DIE ESSAY, PRODUCED FOR THE 1861 CONTRACT COMPETITION. This essay and one which is similar but has several differences (offered in our Sale 890, lot 103), both with pencil-drawn numerals, are the only recorded examples.